On Sunday 4th of November 2018, thousands of London’s Muslims and Londoners from other faiths united at Marble Arch to send a strong signal that Muslims and non-Muslims stand together to defeat hatred and terror through love and unity. 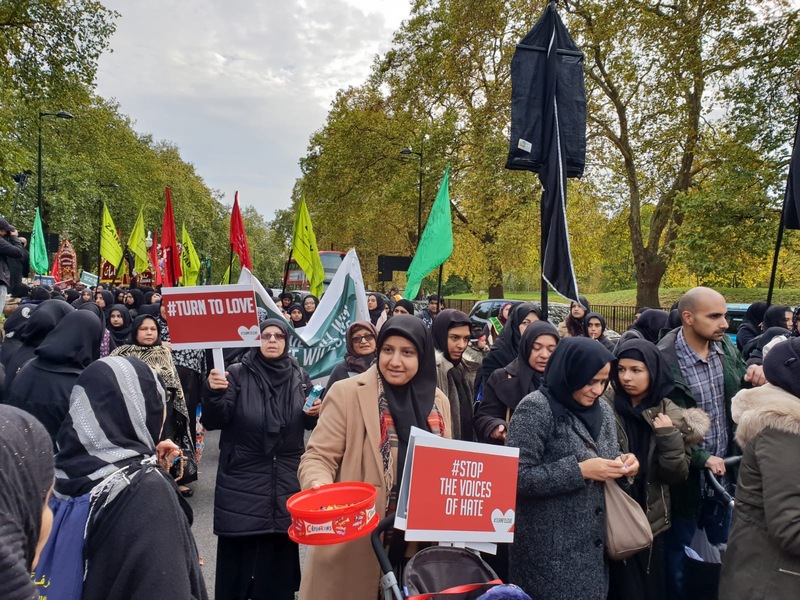 The march was held during the commemoration of Arbaeen, which is one of Islam’s most important religious events, commemorating the death of Hussein, the prophet Mohammed’s grandson. The voices of hate and extremism are aiming to divide communities across the world, Islamophobic, anti-Semitic and anti-immigrant rhetoric is on the rise throughout Europe and the United States (here in the U.K. Muslims suffer disproportionately from hate crime attacks with 52% of religious hate crimes committed against Muslims and extremist terrorists (both ISIS-inspired and extreme right) commit heinous crimes and violence, killing innocents from the streets of Baghdad and Karachi to the tubes and squares of Paris and Manchester to the Mosques and Synagogues of Finsbury Park and Pittsburgh. The Muslim communities of London call for a United March Against Terror and Hate under the slogan “#Love is stronger than hate”. The Turn to Love team, a consortium of volunteers bringing people together from diverse faith communities, youth groups and volunteers from the corporate world, attended and took part in spreading the message of unity. The event started with speeches and prayers at 11.30 at Marble Arch, with the dove release taking place at 12.30 by faith leaders, including Rabbi Herschel Gluck OBE, Yousif Khoei OBE, Dr Sayyid Fadhel H Al-Milani, Sheikh Ramzy, Shaykh Yazdani of Fatwa Council UK, Father Nadim Nassar, Cllr Arshad Mahmood, Rajnish Kashayap from Hindu Council UK and Bonnie Evans-Hills.